Webinars have emerged as one of the most powerful tools for driving the buying cycle. While they primarily enjoy a reputation as a lead-generation tool, there’s much more that webinars can do. From thought leadership webinars that build awareness to product announcements that support cross-sell and upsell activity, there isn’t a step of the buyer journey that hasn’t benefitted from webinars. Why do webinars have such a strong influence on the buying cycle? By their very nature, webinars are highly engaging, information-rich events. 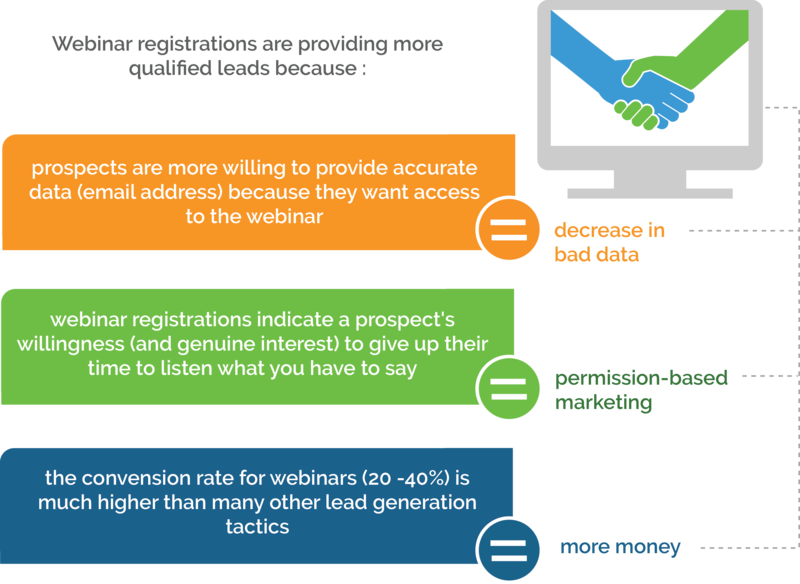 One of the key reasons businesses run webinars is to generate leads. Webinars are excellent at providing more qualified leads and providing high conversion rates. Webinars provide human connection, increase your audience’s familiarity with your experts and generates affinity by sharing valuable knowledge and answering questions. All of which increases the intent to purchase. Engagement drives results. There are some surprising statistics that illustrate the importance of following up with webinar participants within an hour of a webinar and for sharing recordings of the webinar for those people who registered but did not join the live event. Use of professional support on the day. An MC / facilitator to moderate and orchestrate the webinar, host Questions & Answers session and provide technical support for presenters and attendees. Statistics from ReadyTalk, part of PGI which is one of the largest Webinar providers, report an average marketing promotion spend of about £2,000. It all depends on the business and your market. A good start would be to review your marketing spend on physical workshop and seminars and match this for your webinar promotion. When you turn your webinar into a recording, you can increase the number of qualified leads from 29 to 69 people per webinar. The convenience of being able to join the webinar at a time that suits people provides a massive boost. The cost depends if you already have the material or if a guest speaker is going to provide the majority of the slides and content. Professional webinar pitch script and presenter coaching is an option worth considering if you are new to the world of webinars. In addition, consider enlisting professional graphic design support to make content eye-catching and memorable, Nobody wants to look at slides crammed with bullet points anymore! Budget £500 upwards, depending on the complexity of the business and objectives for the webinar. This would provide a 90 min interview to learn about the business and provide a Webinar Pitch design and script. Professional support for about £350. This would include a rehearsal with the presenters, An MC/facilitator to moderate and orchestrate the webinar, host Questions & Answers session and provide technical support for presenters and attendees. These are one-off costs and can be used to record videos and podcasts in addition to all your webinars. It’s very important to have good quality audio and video. External devices provide better quality than the majority of inbuilt speakers and webcams. Almost broadcast quality microphones cost about £120. The Yeti Blue USB Microphone is excellent. For video, the Logitech C920 HD Pro USB 1080p Webcam provides HD quality video for about £60 and simply plugs into a USB port on your computer. An additional factor to consider is lighting. It’s often overlooked. To be professional you need to be visible. A simple natural daylighting set up is very inexpensive. There are many to choose from on Amazon. Budget at least £35 and it won’t be necessary to spend more than £100 if you want to go for something that would work for a meeting room, in case you need to light more than just yourself at a desk. Basic video and screen sharing can cost from as little as £17 per month and Zoom is a good service and offers excellent value. It offers more features than GoToMeeting which is a more expensive basic service. These entry-level packages are great for team meetings but are not full webinar services. If you want to be able to conduct polls and have better chat functionality, then a full webinar subscription service should be used. Zoom offers higher tiers of webinar service and it’s recommended that you read their features and see their latest rates on their website. As of Sept 2017, the Webinar rates start from £43.99/month for 100 attendees. Other important features are registration and analytics. If you are conducting a multi-channel piece of promotional marketing, you need to have a slick automated registration process. Full webinar services offer customised branding: enabling you to add your logo and customise emails and registration forms. This is not available on the basic video meeting subscriptions. The more sophisticated tiers of webinar service also provide analytical reports on registrants, attendees, polling, and Q&A for follow up. If you take a low-end figure of qualified leads from the average statistics, that works out at £3164 / 29 = £121 per qualified lead. Then take the low end of the conversion rate of 20% and that would bring in 5.8 leads, so round that down to 5 converted customers per webinar. The next question is – how much net profit do you make on average per customer ? If it’s <£600, then a professional webinar will probably not be worth doing. The better option would be to undertake a DIY webinar and cut down on promotional expense. Let’s take another scenario if you know how much net profit you make from one average customer, how does that compare to the cost of a professional webinar? Can you still make an attractive profit from a professional webinar if you only had one conversion ?. If so, then it’s worth going for a professionally supported webinar. As you build more experience, you’ll find ways to reduce cost. The opportunity to win business from sharing the webinar recordings and repeating the webinar for different groups should enable you to get an attractive ROI from webinars. Hopefully, the above breakdown and considerations will help you make the decision about using webinars to promote your business. 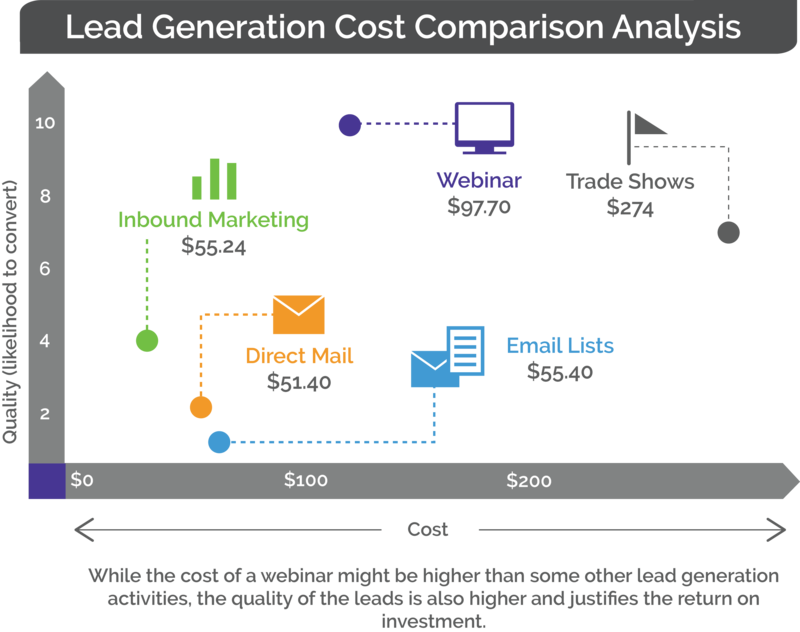 The below table comes from a report created by ReadyTalk in the USA, Their cost per lead calculation comes out at $96 but it’s interesting to note the comparison with other lead generation tactics. The key question is – what does it currently cost your organisation to generate a lead using your existing marketing activity? 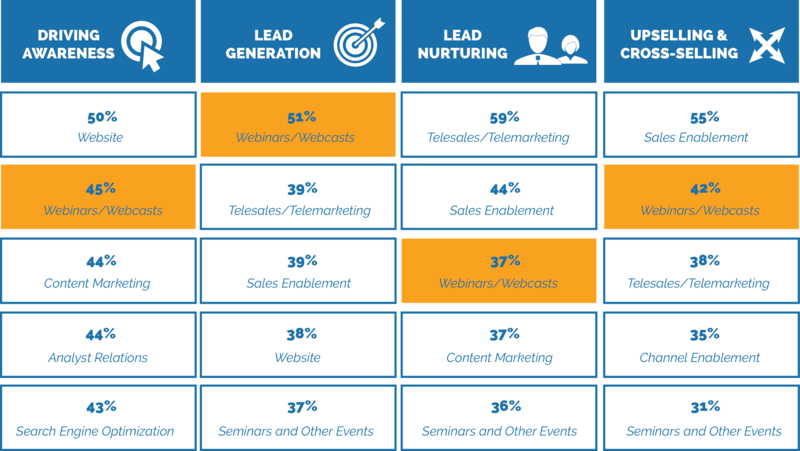 The conversion rate of leads is higher for webinars than it is for the alternative promotional mechanisms. Compare the figures in the below table with the promotional costs and experience in your business – that should give you a sense check on the picture in the below diagram. Once you have considered the costs and benefits, pilot a webinar and measure the results against your expectations. Enlist professional support. If one of these is missing, you have a “suspect” and will waste valuable time pursuing them. Can you pre-qualify the audience and only talk to prospects, or will you use the webinar to sort out the prospects from the suspects? What is the outcome you want to achieve? Are you wanting to establish authority, share information or entertain? You need to add value to the audience. It can’t be a pure sales pitch. Do you have industry insights, new research or subject matter experts as speakers? It’s important to balance the time allocated to sharing valuable information versus the time you spend pitching. Do you want to find out more about the audience (prospect vs suspect)? Do you want to learn more about their problems? Consider sprinkling in live polls and quizzes in the webinar design. Is there a decision you’d like people to take at the end of the webinar? A useful framework to help you consider the purpose of your webinar is to conquer these three questions. What do you want them to think, feel and do? Most webinars last for an hour. If you schedule an hour, in reality, you will only use about 40 minutes for content. You need to allows time to gather people at the beginning, the introduction of speakers and time for Questions &Answers. A useful way to gather people is to ask them where they are calling in from? They can respond in the chat area. It starts the interaction and engages people as others are joining. Housekeeping – explain the protocol for questions – do you want people to write their questions in chat area or will you offer the option of opening the mic and take people off mute and allow them to speak? If you are establishing authority – how many speakers will you use? Will you use talking heads i.e. sharing a video for the speakers? Or, will you be talking to slides and using audio? Video – creates a stronger bond but it presents more technical challenges. You can use both. Have a backup plan – a slide with photos of the speakers. Set a limit of 3 minutes per speaker to provide a quick bio before they start. It’s amazing how people gabble their name and don’t provide a clear explanation of their position in the organisation before they launch into delivering content. Tips for the introduction – What is their niche? Have they published something, won awards, created an insight, achieved results? Devote at least 10 minutes to this and cover at least four dimensions when explaining the problem – time, money, health and emotion. What frustrates them? Use statistics and position them as a series of ‘did you know facts ‘? Aim to articulate their problems even better than they can do themselves. Use full-screen photographs and overlay with brief short facts – no more than 10 words per slide. Purchase high-quality images from Getty / istock. Do not grab low-resolution images from Google that people have seen before. Create infographics to make statistics pop off the screen. It’s at this point that polls can be used to engage the audience and see how strongly they relate to the problems you are explaining. Test their problems. You would not list all of the below questions at once, but this is a selection that can provide real insights and hooks for the follow-up post-webinar. How happy they are with their current plans to fix the problems. How open are they to finding new solutions to their problems? This is where you add the value to the audience. Educate them with new ideas and perspectives. Share insights from market reach and surveys. Share approaches that have worked. Introduce experts and use a storytelling approach to bring relevant case studies to life. Explain the What and the How of your solution and the 3 key benefits. What is the ultimate result that you provide? Offer free tools people can request to download after the webinar. These are gifts. You are adding value but not charging for them. These tend to be digital – video, audio, reports, templates, checklists. Explain what you believe in. What’s important to your organisation? Why you do, what you do. What are your big vision for the industry and the impact that your organisation aspires to make? When you explain your Why, it builds trust with the audience and creates transparency. It’s all about being authentic. It raises the energy level at this point in the webinar. This is important since the next section sets out the opportunity. By the time you have followed all the preceding steps, there should be a sense of ‘what’s next’ in the air. It’s now time to shift the audience from listening to playing. You now need to create excitement about the possibilities of working and being supported by your organisation. It’s critically important to be confident and optimistic in the way you present the opportunity. Not all presenters do this naturally. Consider enlisting a professional facilitator who can coach the presenters. The call to action needs to be practical and immediate. You must spell out next steps that the audience need to take if they want to pursue the opportunity with you. Explain the logistics of taking action. The more specific you are, the better the results. Invite them to continue the conversation after the webinar. For those people who want to get access to new resources in the future, provide the opportunity for them to connect with your organisation. The strongest way to do this is to invite them to join an invitation-only exclusive group on a social platform. GPSgoaltrak has developed a private social platform that can be branded for your organisation. You control the membership and it avoids the distraction that the mass social sites have. If you use LinkedIn or Facebook groups – people quickly become sidetracked by the activity and posts of their friends and colleagues. Are they the approver of budget? Would they like to be contacted for a one to one discussion? Leave the participants with an impression that lasts. It should be short, powerful and emotional. Let them know what you’re best known for as an organisation. If they were to talk to your existing clients what they would tell you that we are the best known for. . . It could be a specialisation, winning awards, the results you produce for your customers. End by making an emotional connection. For example say, ‘After working with us, our clients feel <add an emotional description as appropriate>‘ This ensures the webinar ends with high energy and on a high note. We’ve covered the roadmap for a successful webinar. The content and approach is clear. But there’s one pitfall. An area that can undo all the preparation of content. That’s the failure to practice your pitch and delivery. Speakers need to maintain high energy levels and not be hesitant at any point. The quality of video and audio has to be spot on. The next section goes into more detail on the practical steps you need to take to ensure success on the day. After all the preparation, it’s critical you do everything you can to ensure all of your attendees and panellists can hear and see your content. If they can’t, your webinar will be a non-starter. You’ve got to ensure a glitch-free experience for every attendee — and that means testing every element of the webinar process before you show up for the real deal. This is a repeat of Principle 10 in the above section. Rehearse, Rehearse, Rehearse. If you’re inviting guest panellists to join you during the event, ask your guests to join you for the test run. Check everyone’s audio, and ask your panellists to use headsets to eliminate echoes and tinny-sounding presentations. Make sure your slides work smoothly. If you’ll be switching presenters, make sure your panellists can advance the slides or show their demonstrations. Make sure recording works and creates a usable video file. Recruit a couple of colleagues to attend the webinar, and get them to do backup recordings for you. Recruit a wingman or professional facilitator. Having a wingman takes a lot of stress out of webinar presentation. If possible, recruit a colleague, coworkers, or assistant to be your behind-the-scenes person on the webinar. This person’s job is to help attendees troubleshoot individual problems. This way, you’re not fielding “I can’t see this in my browser” questions while you’re trying to present. That assumes the person has experience of webinar, if not, than hire in professional support. Use the short biographies you have prepared for each of your panelists. Practice reading them beforehand so that you’re ready to introduce them when the time comes during your live event. If you’re home-based, carefully remove children and pets from the area where you’ll be presenting. Also, organise papers and other materials to minimise shuffling and page-turning while the event is live. Nothing is worse than a webinar organiser who kicks off their event 10, minutes late (yes, I have seen it). Be organised and in control. Introduce all of your participants/ panellists. Before the event officially begins, introduce the participants and panellists to the audience. This provides proper recognition and can help you avoid confusion once the event starts. Don’t forget to hit Record! You will want the recorded version for posting later. You can create additional content on your site with it, plus you ensure that those who could not make the live event can still see your webinar. This can seriously boost the number of qualified leads and conversions from a webinar. When you’re running a webinar, something almost always goes wrong. Let your wingman / professional facilitator deal with the issues, if possible, but don’t be afraid to pause your presentation temporarily if the situation demands it. The difference between success and failure in the webinar world lies in your ability to recover from problems. Stay flexible, keep your sense of humour, and have a good back-up plan. I hope you have found this report useful. I offer a range of services and platforms that support virtual working and would be delighted to have an exploratory conversation to see how I might help. Goal-setting methodology and platform that increases the effectiveness of virtual team leaders and helps them align, motivate and develop their remote team members with the outcome of boosting business performance.